For twenty-five years, science fiction fans have enjoyed watching the 24th century adventures of Captain Jean-Luc Picard and the crew of the USS Enterprise NCC-1701-D. This anniversary-edition Keepsake Ornament comes complete with a display base, so you can relive the excitement felt at hearing the opening music year after year. Attach ship to base and press button to hear Captain Picard’s monologue and music from the opening credits of STAR TREK: The Next Generation. This entry was posted in 064) 2012 Enterprise D, 2012, Battery, Display Stands, Ent. 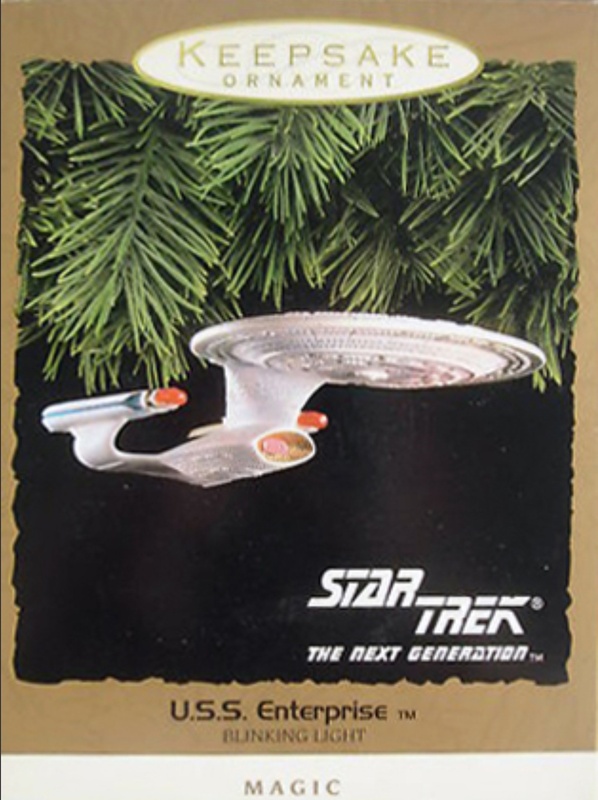 NCC-1701-D, Lynn Norton, Magic Series, Magic Sound, Master List, Ornaments by Artist, Ornaments by Era, Ornaments by Material, Ornaments by Pwr Source, Ornaments by Series, Ornaments by Ships, Ornaments by Theme, Ornaments by Year, Ships, ST: TNG (TV) on October 24, 2011 by garfieldandtrump. 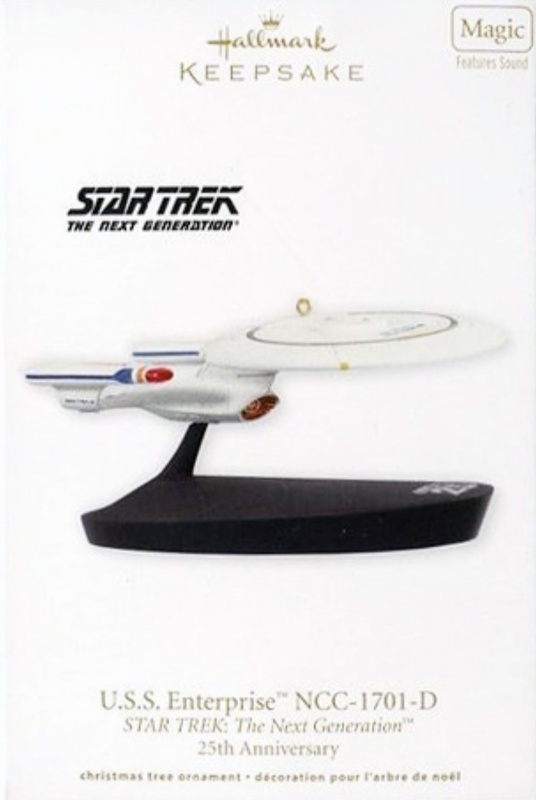 This set of three miniature Hallmark ornaments feature smaller versions of previoulsy released Hallmark keepsake ornaments – The Starship Enterprise from the original tv series, U.S.S. Enterprise 1701-D, and the Klingon Bird of Prey from Star Trek: The Next Generation. 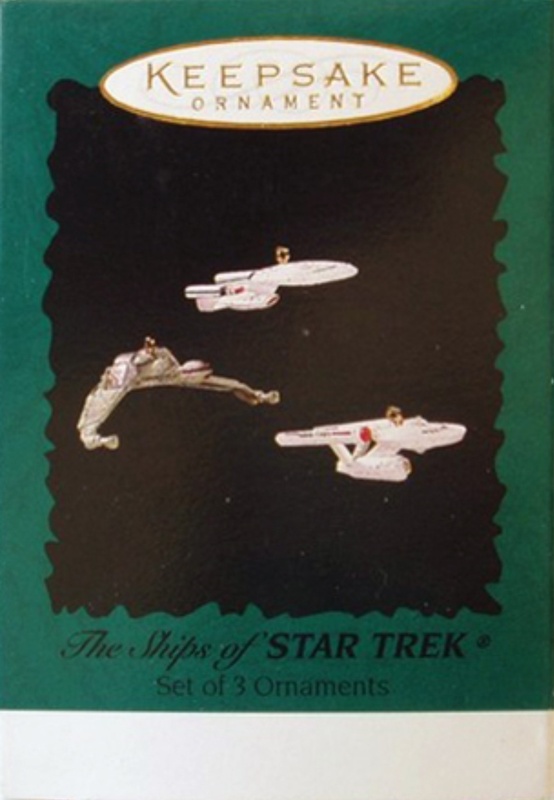 These miniature ornaments can hang independently, or be hung from the 2001 Space Station Deep Space Nine Hallmark ornament. 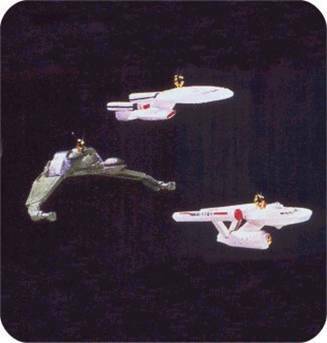 When combined with the 2001 Starfleet Legends, you can create your own miniature Star Trek fleet. This entry was posted in 005) 1995 Ships of Trek, 1995, Ent. NCC-1701, Ent. NCC-1701-D, Ken Crow, Klingon Bird of Prey, Lynn Norton, Master List, Minis, Ships, ST: TNG (TV), ST: TOS (TV) on October 20, 2011 by garfieldandtrump. Box Text: The U.S.S. 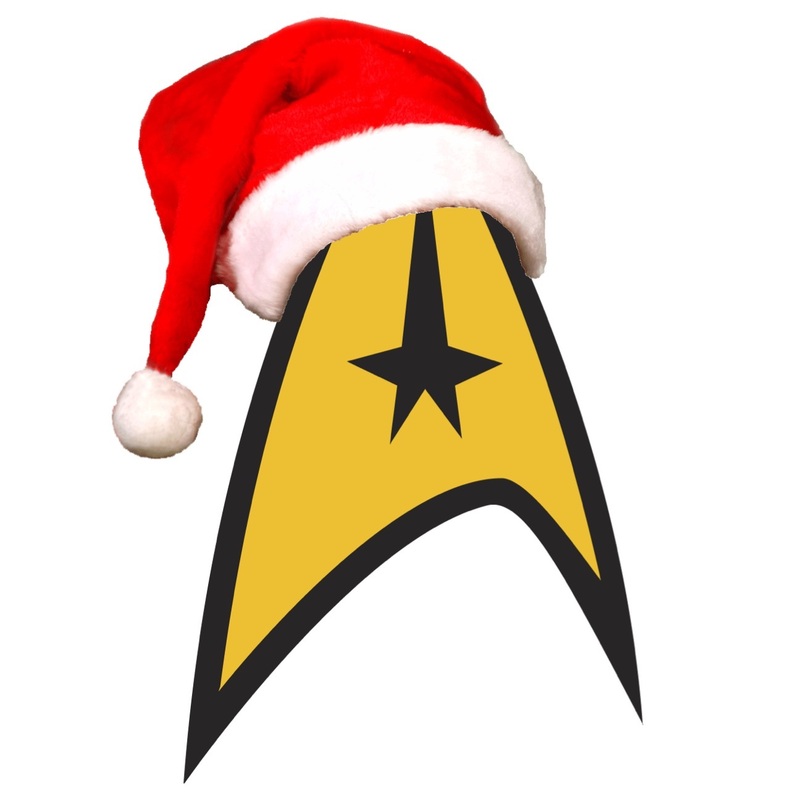 Enterprise from the TV program STAR TREK: THE NEXT GENERATION, voyages to your galaxy to light up your tree. This unique starship, with its blinking and glowing lights, will fill your holiday with Keepsake Magic! Lynn Norton…“At the time, Paramount would send me original blueprints and photos of the filming model as it was being constructed. I had access to detail that wasn’t readily apparent on our TV sets in those days, and I was able to explore and appreciate the design. I always imagined how I wanted to be part of the teams that built those studio models. It was thrilling for me to see the materials they were sending me. What appealed to me most was the level of detail visible on the hull and nacelles. The original was very simplistic in nature, and I had no problem with that. On the D, everything was busy. This entry was posted in 003) 1993 Enterprise D, 1993, Ent. NCC-1701-D, Ken Crow, Magic Light, Master List, Pigtail, Ships, ST: TNG (TV) on October 20, 2011 by garfieldandtrump.